Well Played: Interpreting Prince of Persia: The Sands of Time. This paper engages in an in-depth close reading of the game, Prince of Persia: The Sands of Time, in order to parse out various meanings to be found in the experience of playing the game. The experience is approached from the perspective of its narrative development and its game design. This enables an analysis of the relationship between the game's story and its gameplay. Sequences in the game are analyzed in detail in order to illustrate and interpret how these various components of a game can come together to create fulfilling a playing experience unique to this medium. In this paper, the experience of the videogame, Prince of Persia: The Sands of Time, is analyzed and interpreted by comparing two diagrams, one that illustrates the plot of the game's story and another that delineates the stages of interactivity. Performing a close reading of this game from these perspectives enables an exploration of how the game's story relates to the interactive elements of its gameplay. Comparing the results from both the above diagrams helps illustrate the relationship between the game's story and its gameplay and how they can fit together to create a satisfying interactive experience. Of course, this approach wouldn't necessarily be the most apt for analyzing all the different genres and types of games, but I think it is a fecund way to explore the Prince of Persia: The Sands of Time1. One method I don't directly explore is the procedural, computational nature of how this experience is created. Mateas (2005) and Bogost (2007) have written on the importance of procedural literacy, but for the purposes of this interpretation, I keep the focus more on a gaming literacy (GameLab Institute of Play 2007) and explore the gameplay and narrative. Also, in performing this interpretation, Bogost's (2007) ideas on "unit operations" as an analytical methodology are not explicated in detail, but inspire an exploration of how the gameplay and story can be seen as units of meaning that inter-relate in a variety of ways. The Prince of Persia is a classic gaming franchise that started out in 1989 as a 2D side-scroller with strong platforming elements of running, jumping and climbing through environmental puzzles. 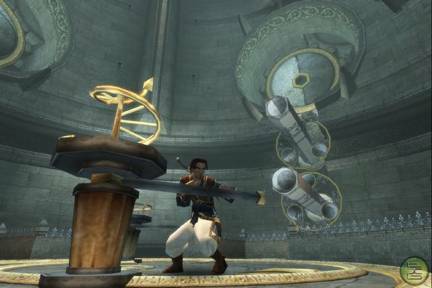 The Prince of Persia: The Sands of Time (2003) represents a re-imagining of the franchise into an action-adventure game in the 3D realm. I chose this game specifically because of its overt attention to story and how it incorporates the act of storytelling into the experience of playing the game. I actually played the original game, but did not keep up with the franchise until this new release and have only briefly played the later releases, Prince of Persia: The Warrior Within (2004), Prince of Persia: The Two Thrones (2005), and I haven't played Battles of Prince of Persia (2005) or Prince of Persia: Rival Swords (2007). At the time of this writing, I have played through The Prince of Persia: The Sands of Time four times; the first time solely on my own, the second with help from GameFAQs to ensure I didn't miss any parts of the game, the third mostly on my own, but with some references back to GameFAQs to doublecheck details for an presentation to MIT4, held in Cambridge, MA in 2005 (Davidson 2005), and the fourth to get a variety of save files to help present these interpretative ideas at the Games, Learning & Society Conference 3.0 held in Madison, WI in July, 2007 (Davidson, 2007). Each time took roughly 10-12 hours of gameplay in order to successfully complete the game. Also, I should note that 3 of my experiences are with the Nintendo GameCube version of the game, but the 4th was with the Sony Playstation 2. The game was similar enough across the two platforms that it doesn't merit more detailed discussion in this regard. 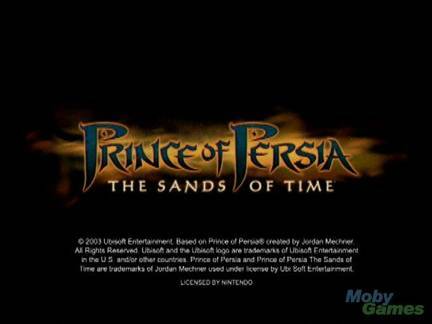 The Prince of Persia: The Sands of Time starts with a short teaser animated movie before you hit any buttons. The movies slowly pans over a desert/oasis landscape that morphs into a woman asleep in bed. A raindrop plops into a puddle and the woman awakens. 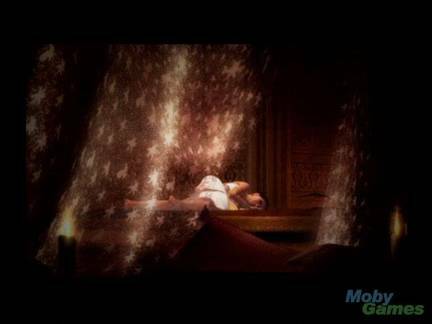 When you press "Start", you find yourself in control of the Prince on a terrace at night, light spills through the curtains from the room within providing some indirect control in tempting you to enter (see Figure 3). To start the game, you have to walk into the bright light in the room, which triggers an introductory movie. 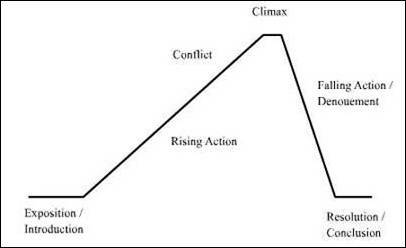 Here you are shown a basic overview of the initial exposition that starts the plot. The Prince speaks in a voice-over discussing time, which he claims is not like a river, but more like a storm. He invites you to sit and hear a tale told like none you've ever heard. The Prince with his father, the King, and their army approach a city. A Vizier stabs someone and the battle starts as the King's forces invade the city. It seems that the Vizier and the King were working together. The Prince wants to impress his father by winning the treasure. He gallops his mount forward as the structure collapses and the Prince is thrown from his horse into the city. This scene ends with the Prince stating that he wants the honor and glory for his father. It's very economical with time, squeezing information in quickly before allowing you control to play. So in a short amount of time (just over two minutes really) you are able to start playing. You now have direct control over the Prince character as gameplay begins. You have a very unobtrusive interface element with a crooked health bar in the upper left of the screen (see Figure 4). Additional elements are added later as you progress through the game; such as the sand tanks and the power tanks that show the number of times you can manipulate time, and the round circle of time that shows how much time you can control. 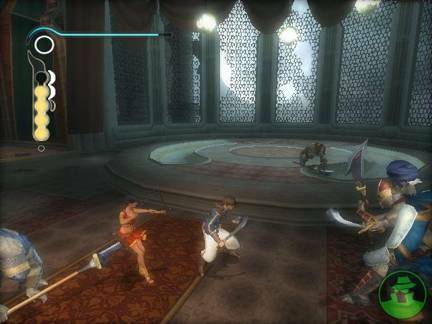 Plus when you get into fights with Farah (the daughter of the Sultan) at your side, her health bar appears as a red bow in the upper right of the screen. You immediately begin to see textual instructions on how to use the controller to direct the Prince's actions through the 3D game world. These instructions appear across the bottom of the screen for a short time and are in relation to the context of the actions you should be performing to best proceed. You are first directed on which analog stick controls the direction in which the Prince moves, and which stick controls the camera angle. The environment is being rearranged by the raging battle around the Prince. The directions in which you are able to move become determined by the changes in the environments. These changes set up the puzzling style of platforming gameplay. In essence, you have to figure out how to move through the environments in order to proceed through the game. And of course, there are the classic adventure game puzzles that require you to move boxes around. So while there is a feeling of open-ended choices, it is actually a linear game that uses environmental puzzles to direct your progress. So, you begin to learn the rather amazing physical abilities of the Prince as you can run, jump, climb and drop your way through the areas. Interestingly enough, you automatically climb small ledges (with no button press) but you are given instructions on which button to push to jump and which buttons enable you to climb up surfaces and drop from ledges. 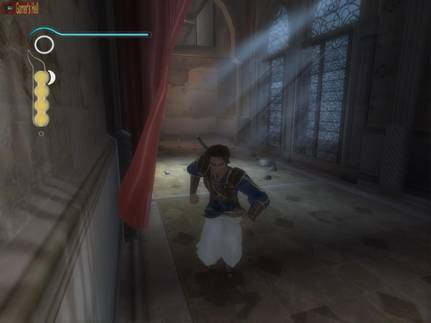 Often these types of actions and button presses are context specific; for instance, pressing the (x) button (on the Gamecube: it's the (O) button on the PS2) to drop only has an effect in the game if you have the Prince in a position within the environment in which he can drop. Also, if you do nothing at all, the Prince goes into short idle animation cycles showing him looking around, stretching, dusting himself off, etc. A nice visual touch that starts conveying the personality of the Prince. These initial textual instructions and the environmental context enable you to begin developing intuitive control of moving the Prince in this world. At this point of the experience, a short plot exposition has been given and the player is in the involvement stage of interactivity, being introduced to how to play the game. It seems like common sense that exposition and involvement occur at first, but the Prince of Persia: The Sands of Time does a good job illustrating how to do this well. I think it's important to give a player some exposition in order to pique interest as involvement begins, but too much exposition for too long can be a distraction from involvement (especially if it's a long scene that does not allow a player to skip it all). Concurrently, it's crucial to afford the player the opportunity to play as quickly as possible so that the interactive experience of the gameplay can start. In terms of units, we are seeing the physics of the gameworld and abilities of the Prince to move through them. This is interlaced with the Prince's voice-over as he talks to himself (and you) adding to the story. Back in the game, you quickly discover that the Prince can run up and across spans of wall (Figure 5) as well as jump and climb. You are also shown how to break through small barriers with your sword. Often there will be quick cinematic cuts when you perform exciting physical feats: the camera launches out and gives you a dramatic view of the Prince in action (sometimes in slow motion as well). These in-game cinematics are units that go beyond the gameplay itself into a "Hollywood" display of "your" amazing feats. You get to watch how the Prince is incredibly athletic. And when you happen to die by unsuccessfully completing an acrobatic feat, the Prince speaks in voice-over saying, "Wait, wait . . . that is not how it happened... Now, where was I?" and you are reset to the spot right before you accidentally leapt to your demise (more below on distinctions of this experience as you gain some control over time). The voice-overs continue the development of the Prince's character, and they also foreground that this experience is a story the Prince is relating. Another example of this is when you pause the game, the Prince asks, "Shall I go on?" and when you resume play he says, "Then I shall continue." If you are hit during fights, your health bar will reflect the damage. This gives you a sense of how you're managing the fight. Once you vanquish your foes, you can sheath your sword or it will occur automatically, which is a nice visual indication that the fight is over and you are moving into the platforming elements of the game. This makes a clear distinction for the player about the two units, or major types of gameplay (platforming/puzzling and fighting) that alternate throughout the rest of the game. A new wrinkle is introduced with the addition of contextual cinematics that occur when you enter a new area. These cinematics give an overview of the area (which feels somewhat akin to a short level) panning away from the Prince to the exit of the area and back across; showing the environmental puzzles or the enemies or both, and giving a sense of what needs to be done in order to progress (the mission in this level as it were). You also reach the first save checkpoint. 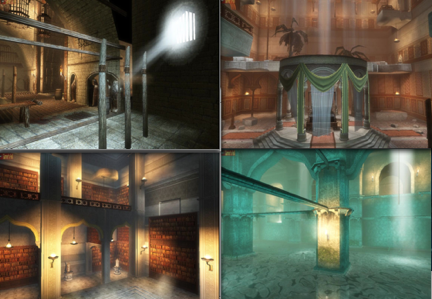 The Prince of Persia: The Sands of Time uses the mechanic of checkpoints spread out across the environments to enable a player to save the game progress (more below on the development of the method established for these checkpoints that differs from the first checkpoint). Each time you reach a checkpoint there is the option to save, quit, or continue and the storytelling element is foregrounded again with the Prince asking, "Shall I continue my story from here the next time we're interrupted?" When you save, he says, "Done, I'll start the story from here next time." If you choose to quit, the Prince asks, "Do you wish me to leave before finishing my story?" and if you choose 'yes' he says, " As you wish," if you choose 'no' he says, "Then I shall continue." Each checkpoint is named (e.g. The Maharajah's Treasure Vaults, Atop a Bird Cage, The Hall of Learning , etc.) and this gives a sense of chapters in a story as well as a narrative flourish to the game's menu mechanics. Also, the general Pause menu enables the player to continue playing, go into game options (sound, display, camera, controller) or quit. You arrive at an extensive cinematic cutscene that distills some plot information much like the introductory movie did. You get the dagger of time and watch the Prince push the button on the handle and reverse the flow of time, which enables him to escape the collapsing ceiling. After short bit of gameplay in which you exit the room, the cinematic shows the victorious King take the spoils of war, including the hourglass and slaves (including the woman from the teaser trailer at the very start of the game). The entourage journeys forth to Persia, and then enters a grand ballroom where the King presents the recently won treasures to the Sultan. The woman from the group of slaves is seen hiding up in the shadows. The Vizier gets the Prince to release the sands of time from the hourglass by inserting the dagger into the hourglass. This causes an immediate and immense sandstorm to erupt and the sands swirl around, turning everyone touched into some magical form of sand creatures. In the chaos, everyone rushes to flee, and the mysterious woman manages to escape. This is the introduction of another interesting gameplay mechanic, the ability to control time. Video games are a great example of Bloom's thoughts on influence in hyperdrive, with each and every new game building on standard genre gameplay conventions and adding some new features. 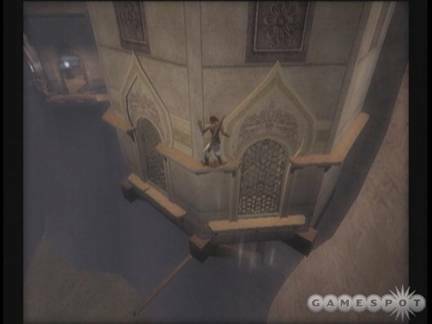 So internally, the Prince of Persia: The Sands of Time develops its gameplay, while in the context of the genre of action adventure games, it adds the mixing of platforming and fighting along with the ability to control time. This ability comes in quite handy as you progress through the game. Eventually you will gain the power to manipulate time in a variety of ways: revival, delay, restraint, haste and destiny. So the units of story and gameplay are both increasing in complexity and relation to each other as you progress. Back in the game, you exit the ballroom through the gate that the woman ran through, and she is just ahead of you (the Prince yells out for her to wait) but the ceiling collapses and you can't follow her, so you have to enter another room. Here is where you first see a little shining pile of sand that you can absorb with your dagger. This helps add more sand to the dagger so you can control time even more. These little piles will be sprinkled around environments from here on out. You now have some environmental platforming to do in order to proceed to a point in which you reach another fight with creatures. After successfully completing this fight you get a column of light (a save checkpoint) but with this one, you get to direct the Prince into the column in order to save your progress through the game. When you walk into the column you see another vision of the future ahead of you. 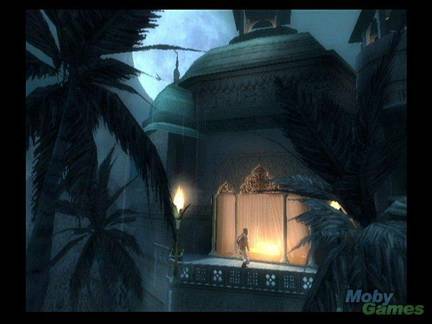 Screenshot of the Prince at the Magic Fountain (Ubisoft 2003) IGN.com. 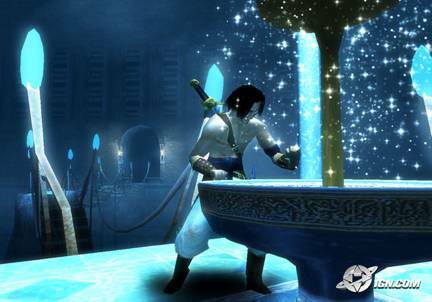 As you approach, a cinematic takes over showing the Prince drinking the water, as shown in Figure 8. Whispering tones accompany his entranced look as the scene fades to black again. You are then returned to the moment right before you entered the mysterious hallway. The hole in the wall is now gone and your health bar increases in length. In a voice-over, the Prince says that he feels better than ever before. So now the player has the challenge of finding this new unit, these other potential "forks in the path" that enable an increase in the Prince's health, which really helps as the fights and platforming get more difficult throughout the game. As you continue, you get a quick cinematic when the woman pulls the Prince aside, introducing herself as Farah, daughter of the Sultan (see Figure 9). She wants the dagger, and the Prince doesn't trust her, so he doesn't give it to her. The camera focuses on her scarab necklace (possibly hinting as to why she survived the sands of time). As they talk, large scarabs approach. The conversation abruptly ends with an attack by the scarabs and the Prince yells to Farah to run. You are now back in control and can quickly fight off the scarabs. As you continue on, you come out to an open courtyard; it is night, and another short cinematic reveals several large birds winging the hourglass up and away, seemingly toward the top of a tall tower. Next, a new facet in the gameplay is introduced; handles that you have to pull in order to open a way forward, but that also engage some time-based mechanism (e.g. a door that slowly closes as you race to get to, and through, it). This first handle task is relatively easy, you pull the handle and a bridge extends for you. You have to run across the bridge before it retracts completely. Now you've arrived at one of the more unique puzzles in the game. A guard up in the distance yells for you to help him activate the defense systems to thwart the monsters. It's a task that requires both of you, but mostly you. You are in the middle of this round cylinder of a room on a round platform that you can raise and rotate (see Figure 10). You need to pick up four long axles in the proper order so that you can raise and rotate them through a maze of channels in the wall of the cylinder and insert them correctly to activate the defense systems. The guard, like Farah before, yells out general instructions and encouragement. Finally, you both pull hanging levers, and then the guard (out of sight, but not out of sound) is attacked by creatures and you hear him die. Puzzle solved, you now have to fight more of these creatures to continue onward. At this point (roughly around 3-4 hours of gameplay) the story is continuing along the rising action. It seems a potential ally, Farah, has been introduced, and large things are afoot as the hourglass has been absconded with. In terms of gameplay, the immersion stage is well established, the game has a solid a rhythm of fighting and platforming with new wrinkles being introduced to both, and the helpful addition of the ability to control time (rewind, slow down or speed up time). So the player is using all the skills learned to survive longer fights with a variety of creatures that require fighting in different ways to defeat them. Also, the player is navigating through more extended sequences of platforming with more intricate challenges to maneuver in order progress forward through the game. Again, this would seem to be exactly where you would want to be as a player, but the Prince of Persia: The Sands of Time has done a good job of mixing these units together to continue challenging you as you progress. The experience is kept pleasurably frustrating; it's not too easy, nor is it too hard. Ideally you get increasing challenges followed by a reward and possibly increased abilities that make it a little less challenging for a bit, but soon ramps up again. Crawford (1984) refers to this as a smooth learning curve in which a player is enabled to successfully advance through the game. Costikyan (2001) notes that "play is how we learn" and move from one stage to the next in a game. Csikszentmihalyi's (1991) notion of flow, in which a person achieves an optimal experience with a high degree of focus and enjoyment, is an apt method for discussing this process as well. And Gee (2004) notes that well designed games teach us how to play them through rhythmic, repeating structures that enable a player to master how to play the game. In terms of unit operations, the units are being juxtaposed well so that the meaning and mastery builds as you play. I mention these ideas because I soon reach a point in the game in which I feel the balance is lost somewhat. In a cinematic, the Prince returns to the large ballroom from which the sands of time were unleashed. Farah is already there, bow and arrow in hand, fending off many creatures. The Prince races to her side and discovers that one of the creatures is recognizably his father, shown in Figure 11 (a big point in the story indeed). You are immediately dropped back into gameplay in one of the toughest (and longest) fights of the entire game. I find it somewhat fitting that this pivotal point in the story (a fight with your creature-father) is such a grueling affair. Also, it is your first fight with Farah's support. You see her healthbar in the upper right, and she shoots at the creatures from afar. You are now responsible for keeping her alive during fights, so this adds to the challenge as well. Although during this fight, the space is large enough that you can move away from her and the creatures chase after you. 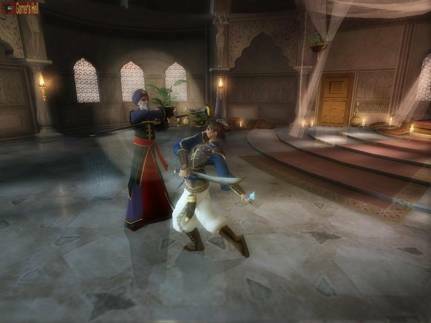 Screenshot of the fight with the Prince's Father (Ubisoft 2003) from GameSpy.com. That said, this fight is also significantly longer and tougher than proceeding fights, enough so that I almost quit playing the game entirely the first time I reached this point because I had such difficulty successfully finishing this fight with wave after wave after wave of creatures. This is one of the first fights where the creatures combine attacks more, and often I ended up knocked to the ground with four creatures surrounding me, attacking until I died. The first time through it must have taken me a dozen or so tries to finish it, the second time probably two or three, the third time another four or five, although the fourth time it only took one try. Again, I find some resonance between the gameplay and the story with this being a difficult fight with your creature-father (who takes forever to dispatch), but it was really close to being too hard, and I found myself slipping out of an immersion stage and into wanting to quit. Yet, I had enough time spent and enough skill development from the proceeding experiences, that I was always able to eventually win this fight (each time I did, it was more a sense of relief than anything else). So, this was the first time during the game that I felt the balance of units was a little off, the challenge was maybe a bit too extreme, but it wasn't insurmountable and I was able to get back into the gameplay and story as I progressed. A really nice touch throughout the game is the variety of environments, shown in Figure 13. The art direction of the palace grounds, full of rooms, courtyards and such, is shown through a variety of color palettes, as well as different types of environmental challenges. For example, you navigate through a warehouse, an aviary, high cliffs, royal baths, etc. This variety gives a sense that progress is being made and helps keep the game from feeling repetitive. Concurrently, the sound design complements the visuals, with a variety of soundtracks, all touched with a middle eastern feel and specific to situations (i.e. fights scenes have more of a pounding element, whereas beautiful outdoor scenes are more ambient). Also, the sound effects of the in-game actions add to the experience; crumbling rocks, the swish of the Prince's sword, and the sounds of combat (although I found the shrieks of the creatures to be annoying, especially during long fights). And the vocal talent is quite good, conveying a sense of personality for the characters. The visuals and audio units combine together to give a nice magical Arabian Nights feel to the story experienced. The immersion stage is solidly engaged with the rhythmic gameplay, and the rising action is now directed toward a specific goal, the hourglass at the top of the tower. As Costikyan (1994) notes, a game should require decision-making and management of resources in pursuit of a goal. This adds to both the story and the gameplay. A fun little easter egg occurs during this part of the game. Easter eggs are little hidden secrets that you can ferret out and often give you bonus material. In this game, you come to a rotating switch; a 90 degree rotation opens the gate and you can go through, but if you rotate it 90 degrees more and then break down the wall (which looks solid) you open up a hole and unlock a playable version of the original, 2D Prince of Persia game. You can save your progress in the Sands of Time and start playing the original game, or you can now access the original game from the main menu. Back in the current game, daybreak arrives, giving a nice sense of time to the proceedings and further appreciation for the indefatigable Prince. You continue on with more platforming and fighting. During this part of the game, you come to an interesting cinematic after a checkpoint save. The Prince wakes up with his head in Farah's lap as she calls him her love. The Prince immediately jumps up in a bit of confusion, and you're back into gameplay with a love story in the air. Shortly thereafter you have a new type of puzzle; pushing mirrors around to reflect light throughout a room in order to hit a crystal with a beam of light. You continue onward with Farah until you reach a point where the floor collapses out from under you, causing a cinematic to kick in where the Prince falls, blacks out, and then wakes up alone in the filthy dungeons. The Prince rips of his ruined shirt and now goes bare-chested for the rest of the game (see Figure 14). You are separated from Farah, so finding her has now become a plot point and a gameplay goal. Image showing the stages of the Prince's shirt and swords (Ubisoft 2003) from IGN.com. You work your way up out of the dungeons, fighting and platforming your way back to Farah. When you do get up and out, you find her in the midst of a fight, where you join in to help. After this fight, when you save you have an interesting vision in which you see Farah taking the dagger of time. In a cinematic, the Prince wakes up and becomes a little bit distrusting of Farah, complicating the love story. And so the rising action of the story is in full swing and the investment stage of interactivity is beginning as the end of the game is in sight. You've been playing for about 8-9 hours, and with this complication related, the player has now reached the huge tower in which the hourglass sits at the top. Units in both the story and gameplay are aligning to further the experience and the end of your goal is in sight, you just have to make it to the top. And here is the second time in the game where I feel the balance is a little off, but again I think it also fits within the framework of the story. As you enter the bottom of the tower you come to a small round room, and Farah runs in so you have to follow. The gates slam shut and the room begins to rise. As it rising, some of the biggest, toughest creatures arrive. This climatic fight is by far the longest, toughest fight of the game. And since the area is so small, a huge part of the challenge is keeping Farah alive as you can't draw the creatures away from her. Instead you have to fight and fight and fight. This fight serves as the penultimate rising action as you literally rise up to the climatic moment of finding the hourglass. And so, in terms of the story it's like the fight against your father-creature, a major moment in the plot. In terms of the gameplay this fight took me forever to successfully complete. Like before, I almost quit playing the game because of it. What I found disturbing about this particular moment of imbalance was that it came right when I was feeling almost destined to finish this game. The game had given me the "illusion of winnability," and I thought I was going to have a successful ending (Crawford, 73). I had made it to the tower (finally!) and I could sense the climax of the story. Yet, during my first attempt, it took me about a dozen tries. The second time took five or six tries, the third, another dozen, and the fourth just twice. It was extremely frustrating to have it be this hard, but here is where the story really helped keep me invested in successfully completing the experience. If it weren't for the plot development and the rising action causing me to want to reach the tower and finally get there, and then really, really want to reach the top of the tower, I would have quit. I wasn't enjoying the gameplay at this point (it was too difficult and endless a fight to really keep me invested) but I had so much time and experience invested in the story that I persevered and managed to win (again with a huge sense of relief more than anything else). Although the story also helped give me a huge sense of accomplishment, I had made it to the top and to the hourglass. Then a twist in the story comes at an odd moment. As you leap atop the hourglass, getting ready to insert the dagger, control is taken away. I was at the climatic moment where I was going to win, and a cinematic cuts in, adding a plot twist. Instead of successfully completing the quest, the Prince hesitates. The Vizier appears, summoning a sand storm that whisks the Prince off the hourglass and sends both he and Farah tumbling away into the darkness. You wake up in control of the Prince and walk down an extremely long winding staircase. It's long enough that it seems to be making some sort of point. Finally, you come to an interesting little sound puzzle. You are in a round room full of doors and Farah is calling to you. You can enter a door, and you'll just pop back out another one in the same room. The trick is to enter the doors from which you hear the sound of water. As you work your way through the doors you'll eventually find that the long way down led to the most invaluable of treasures. You find Farah in a golden bath and a seductive little cinematic hints at the culmination of the love story. You then wake up alone, back in control again, but Farah is gone and you have neither your sword nor your dagger. You have just watched a climatic part of the story, now you've come to the other climatic part of the gameplay; some amazingly intense platform puzzling with no dagger, so you have to do this without any time control. You are high up with ample opportunity to fall to your death and no way to reverse time, so you have to really display your mastery of these gameplay mechanics to puzzle through these environments. Also, creatures are coming and you have no sword, but you immediately are presented with a final light and mirror puzzle that once you solve wins you your final sword which is so powerful that one blow eradicates creatures. So fighting becomes different as well, it's a little easier, but again, with no dagger you now have to be more careful. Once more you aim for the top of the tower, but this time you climb up the outside of the tower, which presents the challenging climatic platforming of the game. Like the climatic fight, the climatic platforming is really difficult (see Figure 16). Unlike the fighting, I felt amply prepared for this challenge and believe it was a fair test of my mastery of these elements of the gameplay. The units of platforming operated better than those of fighting. Granted, I think this shows my general preference for the platforming more than the fighting. Also, while I think that the climatic fight had some plot resonance, in the end it's just a really, really long fight. The climatic platforming also takes a long time, but it seems to have a more harmonic resonance with the plot development because the player is physically moving toward the game goal and rising up to the climatic plot point of getting to the top of the tower. Even so, it probably took me a dozen tries each time I played through the game in order to successfully get to the top. 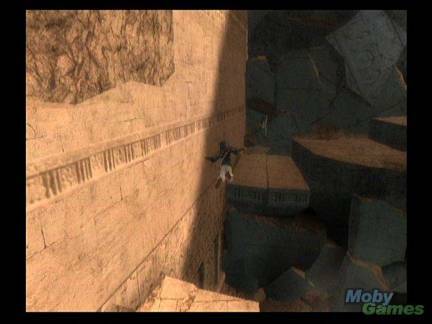 Once you (finally) get to the top, a cinematic shows Farah fighting with the dagger of time and then she falls. The Prince runs and catches hold of the dagger, they both hold the dagger for a second and then she falls to her death. The story of the game you have just played through (which now has never happened yet). This moment brings to fruition the game's narrative throughline and subtext of honor and fantastic redemption, as opposed to the honor and glory the Prince hoped for initially. Throughout, you, as the Prince, are trying to atone for the mistake you made by releasing the sands of time and also the mistake of honor for glory, instead of the true honor of good deeds. You literally get to turn back time and erase this big mistake, while you were also able to rewind time throughout the game in order to fix your little gameplay mistakes. This also harkens back to the importance of stories as seen with Scheherazade in the classic tales in A Thousand and One Arabian Nights. The denouement is now quickly rushing toward the conclusion of the narrative and the investment stage is firmly engaged as a successful end seems extremely likely. All of the little units of storytelling asides become more than just little affectations and show that the whole experience has been the Prince telling his story to Farah (you). The start of the game was actually the Prince walking in to tell her this story (see Figure 17). It's a wonderful moment of frisson as you realize that your time with the game (around 10-12 hours of playing) has been whirled away within the context of the story. The interactive experience is inverted as everything you've done up to this point has no longer happened. Parenthetically, for those familiar with the movie, The Usual Suspects, this reminds me of the revealing twist at the end when everything you've just seen is called into question. Not to completely spoil the movie, but the cinematic experience is also turned upside down as everything to that point is revealed to not have happened. In both cases, the characteristics of the medium itself are used to play with the narrative. This juxtaposed moment has some post-structuralist, self-reflective facets as well. I believe that it's through stories that we relate our gameplaying experiences. Even if a game has little to no narrative, I think most games contain enough fictive elements (i.e. plot, setting, character, theme) for us to use when we discuss playing through a game. These stories contextual our virtual experiences; for on the one hand, we are sitting on the couch, pushing buttons in a coordinated manner, making mistakes and trying again, but on the other, we are the Prince of Persia, manipulating time, achieving redemption and honor, and saving the day. 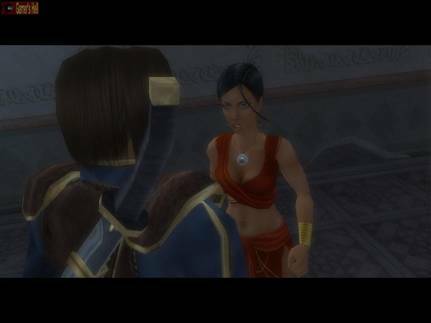 And the gameplaying experience of the Prince of Persia: The Sands of Time is contextualized as a story that the Prince is telling Farah, a story of his "virtual" experience that has now never happened, but he did indeed save the day. And it is at this moment when you realize that while you have been playing the role of the Prince throughout the game, you have also been positioned as Farah listening to the Prince tell this story. This moment represents a unit that illustrates how the interactive experience of a videogame can make manifest a theory of reading in which the reader is just as active a creator in the meaning of the text as the author. You are both the "author" of the story (the Prince) and the "reader" of it (Farah). Your actions as the Prince are also your imagining of the story being told to you as Farah. It is a wonderful moment of ludic narrans in which you are playing through a story being told, an elegant twining of story and gameplay together in this interactive experience. Back in the game, the Prince finishes the story and the Vizier shows up wanting to kill him so that he can try to unleash the sands of time again and have them at his command (see Figure 18). You now have control of the Prince and fight the Vizier. He performs some magic, sending three shades of himself that you have to defeat before you can actually fight him. This is a ridiculously easy fight, especially compared to the climatic fight going up the tower. You can quickly dispatch the Vizier, a necessary fight as he was the primary villain, but one that proves to be the last small part of a larger journey which has already occurred. On a side note, I actually let myself get killed in this fight once to see if the game menu mechanics would change to fit the story. In other words, the Prince is no longer telling a story to Farah, so we shouldn't hear him say, "... that is not how it happened." And they do adjust the menu for this moment in the game, you get a menu that states, "Game Over," and you can select to retry or quit. So the units of story and gameplay are aligned for this part of the game as well. That said, once you do defeat the Vizier you get to watch the final cinematic which shows the redemption and the resolution of the story, and the successful conclusion of the game. Back on the terrace, the cinematic shows the Prince return the dagger of time to Farah for safekeeping. She now realizes that he has averted a war by killing the Vizier who was going to betray her kingdom. Farah asks why he told her such an absurd story and the Prince tries to kiss Farah but she pushes him away in anger. The Prince uses the dagger to rewind time to right before the attempted kiss, and then agrees with her that is was indeed just a story. Much wiser from his experience with the sands of time, he gracefully bows out, leaping up and at her request, bidding her to call him, "Kakolukia." Now, for those paying close attention during the game's cutscenes, this name is a secret that Farah revealed to the Prince in the (now erased) timeline of the game. It is the name a fairy-tale hero of whom Farah's mother told her tales when she was a child, a name to say when she was scared and it would keep her safe, and by sharing this secret, the Prince has shown Farah that the story he has just told (the game that you just played) did indeed happen (which it did on both levels) and that he is to be trusted. Also, while time may have been rewound, we still see entropic effects. While his uniform is now pristine, the Prince himself seems a much more worn character who carries the memory of the experience (of the game played). And with that, Prince of Persian: Sands of Time is completed. So, the intertwining units of story and gameplay are cleverly tied together in the end. In reflection, I think the dual approach of analyzing the narrative plot and interactive levels enabled me to show the moments in this game in which units of both elements were working together to truly engage me in the experience. It was also a useful method for exploring moments throughout the experience that didn't work as well as they could have. Overall, the story development and the rhythmic gameplay help players understand the gaming situation, the "combination of ends, means, rules, equipment, and manipulative action" required to play through the game (Eskelinen 2001). That said, I kept my analysis with both diagrams at a general, high-level progression of the plot and the stages of interactivity. I think this was useful, but I also believe it could be interesting to get even more granular with both diagrams and really dig into units that show the details of the diversity of peaks and valleys of interest curve in the development of the plot of the story as well as the moments of engagement, disengagement and reengagement that occur during the progressive stages of interactivity. I think both macro and micro perspectives would be worthwhile to pursue in analyzing and interpreting interactive experiences. A game can be well played in two senses. First, well played as in well done, so a game can be looked at in terms of how well it is created. Second, well played as in well read, so through the experience of playing games you can develop a literacy of games. Manovich (2001) notes, when engaging new media (or playing a game), we oscillate "between illusionary segments and interactive segments" that force us to "switch between different mental sets" demanding from us a "cognitive multitasking" that requires "intellectual problem solving, systematic experimentation, and the quick learning of new tasks." So, when the units of story are effectively intertwined with the units of gameplay, the rising action of the plot can parallel the rising challenges of the gameplay, and enable us to have a compellingly engaging experience. 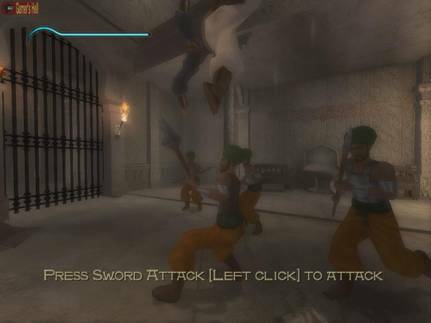 While the story in the Prince of Persia: The Sands of Time was mostly related in cinematics, there was an attempt to inject it into gameplaying moments through the Prince's voice-over asides, and certain pivotal actions the player has to take that move the plot forward. And the gameplay is influenced by the story in the way characters share advice on what to do and how plot points become gameplaying goals. 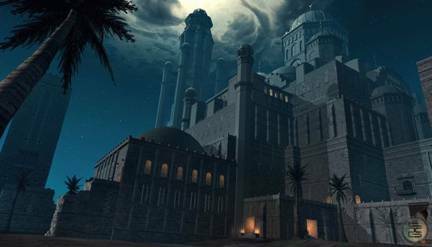 The Prince of Persia: The Sands of Time may have had a few faulty moments of dissonance, but overall, it did an elegant job of combining its narrative and gameplay to provide a fulfilling interactive experience. It is a game well played.